Genetics and trauma can both cause the ears to become deformed. As the most experienced cosmetic otoplasty surgeon in Toronto, Dr. Kasrai can fix a wide range of deformities. You have suffered for years with ears that don't look normal. Their deformed appearance has severely affected your self-esteem and self-confidence. You are constantly embarrassed and hypersensitive to their appearance. While your ear deformity may not be a health concern, it can give your ears an unnatural shape that you dislike. There are a number of ear deformities that exist. Stahl's Bar ear is shown on the left compared to a normal ear shown on the right. This deformity refers to the presence of a vertical bump in the upper portion of your ear (third crus). This is an area that is normally flat. The bump can extend upward to the top edge of your ear, giving it an overall pointy appearance, like the character Spock from Star Trek. That's why they also informally call Stahl's Bar ear, "Spock ear". 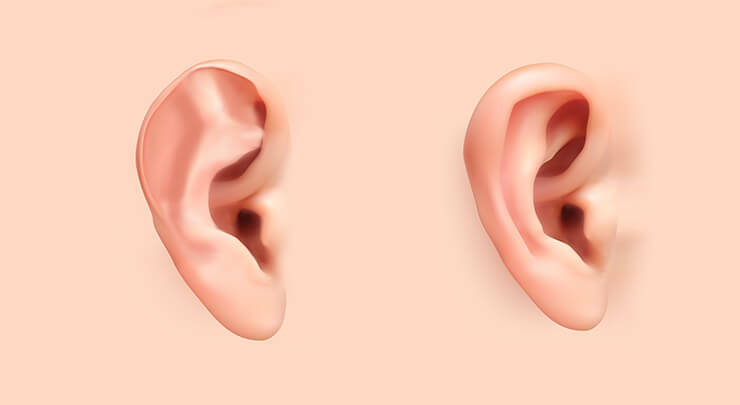 Cryptotia is shown on the left compared to a normal ear shown on the right. 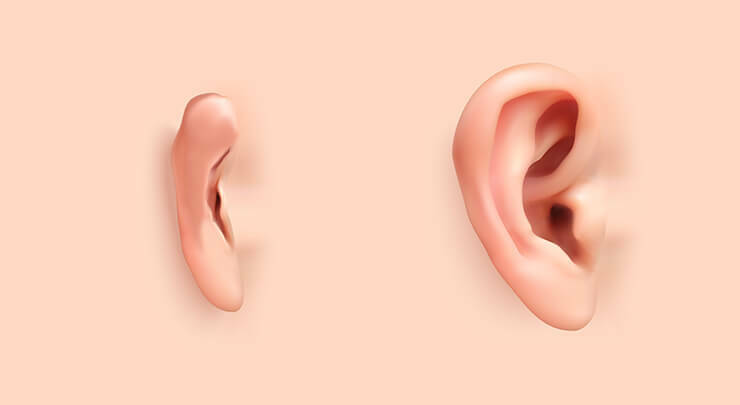 Cryptotia is a genetic condition that makes the very top, front part of your ear look like it's buried underneath the skin at the temple area. This makes your ear contour look undefined from the sides of your head. It can also make your ear look possibly "unfinished". Microtia, also known as "small ear", is shown on the left compared to a normal ear shown on the right. Microtia is when your ears are excessively small and malformed. This is due to problems with tissue formation. If you have microtia, your ears would most likely need to be reconstructed. This is a more extensive procedure but something that I've performed countless of times. Congenital ear deformities can be corrected with ear reshaping surgery. This is a procedure I've performed for over 15 years. The most satisfying outcome relies on an in-depth consultation and assessment. I'll examine your ear condition and discuss your medical history to determine what deformity you have. Then, I'll define a surgical plan that will fully achieve your desired improvement. My goal with ear reshaping surgery is to create an ear that looks normal, without obvious scarring. 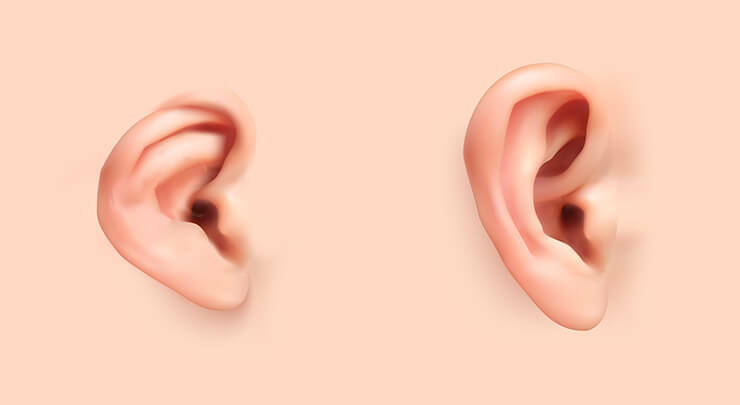 Because I've performed over 2,000 ear surgeries to date and continue to operate on otoplasty patients at least twice a week, I have extensive knowledge and understanding of both the structures of the ear, as well as how to resolve any issues that affect them. My lengthy experience includes treating both children and adults. In fact, a significant portion of my otoplasty patients are children, since it is relatively easy to spot ear deformities even at birth. I previously practiced at the Hospital for Sick Children, where I was part of a world-renowned team that treats children with significant congenital and traumatic ear injuries. For this reason, I can easily adapt to the unique needs of children, who may require a gentler approach. It helps that I'm a mother, too! This procedure is accomplished in two to three hours, depending on the extent of correction. Local or general anesthesia is administered. While each procedure is customized according to what you'd like to correct, it follows similar steps. First, an incision in the back of the ear is made to expose the cartilage. The cartilage is reshaped and repositioned as desired. Then, the incisions are closed and dressed. If your ear needs to be reconstructed, as is often the case for patients with microtia, we work with a team of otolaryngologists who determine the best hearing options on a case by case basis. You'll feel some discomfort after your surgery, which can be controlled with prescribed pain medication. It's important that you continue wearing the bulky bandages and dressing that are placed around your ears at the end of your surgery. I'll remove them, along with any sutures, in about a week. Some soreness and discomfort may be felt, but this can be alleviated with prescribed pain medication. It's important that at least a week is taken off from school or work. Make sure to rest quietly at home during this time, getting up and walking around periodically to minimize your risk of developing blood clots. For the first three months while you sleep, you'll need to wear a headband to protect your ears from being bent or pulled out of place. Avoid vigorous activity and contact sports for at least six weeks. The point of ear reshaping is to make your ears look like the average person's, and that's what you'll have after you've recovered from your surgery! Otoplasty is the general term for cosmetic ear surgery. One kind of otoplasty is ear shaping. This is where I fix a deformity that occurred during either birth or trauma. Sometimes I may have to do an ear reconstruction. What will my ear shaping consultation be like? A thorough examination of your ears will be performed by me. I'll review your medical history. We'll discuss the benefits of the surgery and related potential risks. It is important to me that you're well informed so you can be completely comfortable with your decision to have, or not have, surgery. Do I need an overnight stay at the hospital? For children or for those with more complicated cases, you may need to stay overnight. However, usually, you'll be free to go home the same day as your surgery. How do I prepare for my ear shaping surgery? You should be calm and relaxed before your surgery. This improves your experience and makes the recovery easier. You should avoid the following medications: Aspirin, Advil, Entrophen, ASA, 222s, Naprosyn, Vioxx and other anti-inflammatories that could promote bruising and bleeding. Avoid eating anything after midnight right before your surgery. On the day of your surgery, wash thoroughly with regular soap before you come to our surgical facility. I will give you complete pre-op instructions to follow. How long is my surgery? Ear shaping surgery will take about two to three hours. If you need reconstruction of your ear, surgery will take six to seven hours. After your surgery, you may feel some discomfort which can be handled with prescribed pain medication. You will receive post-op instructions to help you recover. Your head will be wrapped in thick bandages after your surgery. These bandages, along with any undissolvable sutures, will be removed after seven days. At that time, you'll need to wear a headband to cover your ears as you complete the healing process. Please wear the headband while you sleep for the first three months. Avoid any rigorous exercising and contact sports for at least six weeks. Sleep with your head raised to help reduce swelling. Avoid sleeping on the sides of your head. Be sure to follow all post-op instructions I give you. They will ensure you heal properly and stay healthy during your recovery period. How long until I get to see the final results of my otoplasty ear shaping? Full recovery can take up to six to eight weeks. After full recovery you will be able to enjoy your new ‘normal’ ears. I will ask you to stay away from school, work and other activities for about seven days. You shouldn't be able to see any scars after surgery. They'll be well hidden within the natural creases of your ears, or behind your ears. There is a higher risk in patients who are smokers, are diabetic or have poor circulation.